I was nervous about the Arabic, scared that I wouldn’t remember how to read or speak politely after three years away from formal lessons, but strangely, it came right back. Maybe it was the pressure—a nervous stomach that forces letters into words and meanings. I left the first class feeling happy, my brain overjoyed to have been given what it craves: a problem to solve. “You’re so strong,” my sister said to me a few weeks ago. Maybe it’s the sudden summer heat, a combustibility that seems to feed a frantic impotence that can turn on a dime into panic, a chain of worry that feeds itself inexhaustibly. Until I’m too exhausted to feel it any longer: a welcome reprieve. While doing research for work, I came upon a recent theory about the Hadean Age. The theory said that, far from life needing an environment suited to its needs and comforts, the first proto-life may have developed four billion years ago on a planet in the throes of horrific upheaval. The theory relies on the fact that life forms are “dissipative, ordered structures,” which ease the energy pressures of a chaotic system. In other words, life doesn’t require equilibrium; life is the equilibrium required by a hellish world. We take a bit of the edge off. My father used to bring his Greek and Hebrew Bibles to church, referencing them during the sermon. “If you don’t know how to read the language of scripture, anyone can and will tell you anything,” he said. I can picture him glaring at me, saying that maybe it’s not such a good idea to test God, when I imagine asking him if a merciful God means that at any point it can all be so much worse, that we might carry along with us millions of godless hell dimensions that hold all of our merciless fates. It’s funny how the first book of the Bible—the long, awful tale about the beginnings of all things—teems with strange cities. Not simply cities, but destroyed cities, wastelands, disasters—and the stories of those who manage to crawl out of them. 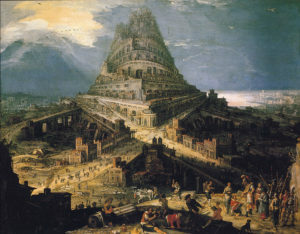 I recently read the story of the tower of Babel for the first time since I was a child, and I was struck by how different it was from the story I’d heard in church. My Sunday school teachers related it as a story of punishment for hubris, perhaps reading some Flavius Josephus on the sly, but it’s stranger than that, more mysterious, more difficult. It’s the story of a group of people coming together in a city right after the world was destroyed by water (horrible cleanup, that, though Genesis skips the details). Let us make a name for ourselves, they said. Let us stay together and care for on another, hold each other. Let no one ever look at our precious lives and families and do anything of the sort again. And God had a look around and said: if they can do this, they can do anything. Sometimes in Arabic class, I’ll look at a word, knowing what it is, and freeze. My muscles will refuse to make the sounds I can make with ease while practicing in front of the bathroom mirror (I think my housemates are getting worried about me). When I’m writing code and refreshing the browser, trying to get a collection of moving cells or branching vessels to appear out of my commands to transform, the muscles over my ribs grow tight. My stomach hurts, angry, when nothing works, and all of my little fears begin to crop up. 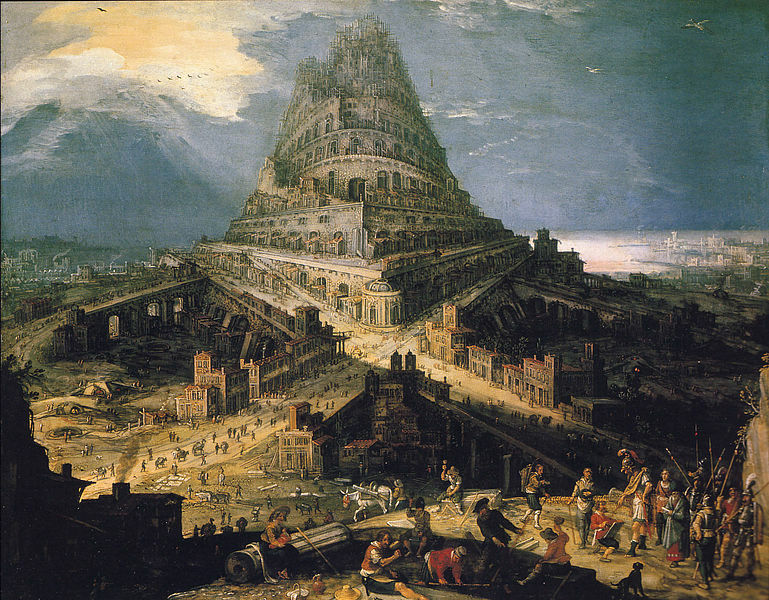 Learning a language, whether I’m speaking to another person or to a computer, is terrifying. The surface consequences are nothing: I’ll be corrected or lose some points I have no use for anyway. But the stakes feel high, that old survival-threatening problem of being unable to understand or express. It’s quite something to be taught that different languages are a curse, isn’t it? I like a story that makes you work, even if you might never see the full meaning. I’ve read that our irrational daily fears or those blown out of proportion serve as containers for the big terrors we can’t look straight toward: the idea that we’re irrevocably wrong and damaged, that we are not loved, that another will see as us sub-human and tear down everything we’ve built in a moment. I’ve been trying to thank the irrational fears when they crop up, grateful that the container won’t spill its contents until I’m ready. I don’t know the meaning of the tower, but I can feel the hurt in it, the struggle to remain faithful when you can’t look directly at your fear, your sorrow. I can see someone reading about the city and tower and thinking, there’s that jerk of a violent god again. And God is weird and not always likeable in the stories. But he’s also never boring, and he makes you think: about the containers in which people store their suffering, about all the meanings under the meanings behind the stories. I’m deliberately staying super busy this month to keep from dealing with worries I can’t put into words, though I can feel them hovering behind the all the what-ifs that set my heart pounding. And I find that I don’t want to overcome worry. I don’t have that kind of fight in me, dissipative hell-soothing structure that I may be. So I yield to it because I have faith in stories, especially those that veil and those that lie in wait for the exact right moment, and those that unfurl and unfurl and never ruin your imaginative enjoyment by revealing their full meanings. Above image by Hendrick van Cleve III, via Wikimedia Commons, used with permission under a Creative Commons license.